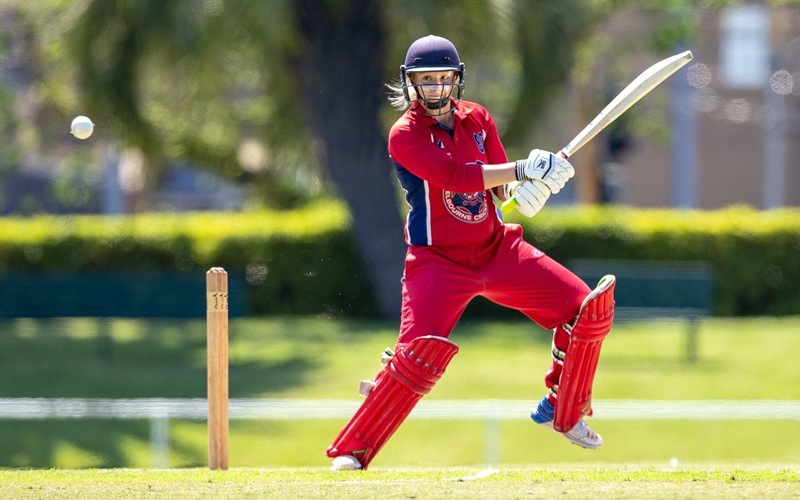 Fair to say that Amy Yates (pictured) has been threatening to make a ‘big one’ having got a ‘start’ in each of the women’s Premier 1sts matches played so far this year and made a couple of ‘nice’ 40s and a 50-odd. Well there is nothing like ‘going on with it’ when you break through the barrier and Amy did just that yesterday, spanking 173 not out off 169 balls (16 fours and three 6s), batting through the 50-over innings. Along the way Amy collected a couple of club records, her 173 n.o. being the highest individual score by an MCC female cricketer. Up the other end for most of Amy’s innings was skipper Teagan Parker who also helped herself to 65 but, more notably, put on an opening partnership of an even 200, clearly the highest partnership for any wicket in any grade in our women’s cricket history. Just to add a little cream to Amy’s day, she collected three wickets, and with Tegan Orwin also taking three, the Demons easily accounted for Premier 1sts newcomers Ringwood. The 2nds also dominated their match, largely thanks to the all-round efforts of Izzy Cloke (74 and 3 for 12). Georgia Ricardo (44) and Shania McKinnon (37 n.o.) built the score to easily defended 8/242. The women’s 3rds played a T20 double header and finished square with the ledger with a win and a loss. Alana D’Aquino (33) and Charli Killeen (32) were the main contributors to the win over Mt Martha. In Premier men it was left to the 3rds and 4ths to bring home the points as the two-day round against Fitzroy-Doncaster concluded. The 3rd XI figured in a most intriguing and exciting win. They had plenty on the board (277) and the Lions set about the chase at snail’s pace (2 for 40 off 30 overs at one point); a tactic that almost paid off! Having put the foot down after tea, the Lions got the chase down to a run a ball, passing 200 just four down and reaching 5/260, needing just 18 to win. How a game can change with Trent Thompson taking two wickets in two balls, before stand-in skipper Zac Mevissen (who was getting plenty of advice) took two quick ones off his own to have Fitzroy-Doncaster 9/262. The opposition skipper threatened to take the game but his high, towering hook shot was swallowed at fine leg by Josh Ash and a six run victory was secured. It was a real ‘club’ win with a couple of special elements; assistant coach Ben Vague was watching on but wicket-kept for the last 60 overs after Alex Pellin was injured; and Chris Anderson (ill last week), subbed for the 2nds in the first session at the Albert then drove to Doncaster to sub in the 3rds after tea. Perhaps this just made the difference between winning and losing? The 4ths had the Lions 2/50 overnight chasing just 172 and at 2/94 the game appeared to be slipping away. Nik Sirko (3/33) got the breakthrough and followed on with two important wickets after tea. Shane Giese got two important wickets just before the break and Will O’Brien (3/36) closed the game out with 29 runs to spare. The 1st XI was locked in a good tussle with the Lions for most of the day. We couldn’t get ‘back-to-back’ wickets but kept chipping away. When Fitzroy-Doncaster lost their seventh wicket at 236 we appeared a realistic chance however an eighth wicket partnership of 31 thwarted our charge. The 2nds, already behind on 1st innings after the first day, were always going to have to defend an outright points attempt and ended up doing so comfortably. Facing a 1st innings deficit of 183 when the Lions declared, Peter Petricola (73 n.o.) and Charles Lill (47 n.o.) put on an unbeaten 121 when play was called. Our Club XI no.1 team brought up the first Club XI points for the season easily accounting for Old Geelong. Raj Aiyappan (72) starred with the bat and Simon Mellick (5/19) tore through the opposition with the ball. MCC 2 had the bye. Next weekend men’s Premier take on Monash Tigers (1sts at home) where the 1sts and 2nds play Saturday and Sunday but the 3rds and 4ths play just a one-dayer. The women’s Premier teams play Prahran (1sts away and 2nds at Beaumaris) whilst the 3rds have a bye. Both Club XI teams are away to Old Trinity and Melbourne Uni.